We set out on the morning post Dusshera with an intent to try and enter Kanger Ghati National Park. Talking to various sources, we were told that the park is closed until 1st November. However, our determination to enter the forest area gave us the idea of trying to enter the forest from another side - towards Nagalsar. Greenery on the way to Kanger Ghati! While most tourists visit the forest from the highway entry near Tirathgarh, we went via the Ulnar-Nagalsar road which also leads towards the Kailash caves. We expected to be stopped at some point by some barrier but to our surprise, there wasn't any barrier and we were able to enter the forests and also crossed the occasional village on the way. People were still as friendly; however for the first time we saw many CRPF personnel in that area. We continued on till we reached the forest roads and for the first time we regretted not having a sturdier SUV vehicle. Our Indigo still made excellent progress and our driver gamely drove on without minding the roads in the least. The forests seemed quiet as usual; only when we stopped and listened in the silence we realized the liveliness in the air. The leaves falling in the autumn, the quiet, the occasionally racket made by birds, all made us extremely alert as we enjoyed the forest surroundings. In the forest, our intent was to try and visit the Kailash Caves (all caves - Kutumsar and Kailash are supposed to be closed at this time); however we were entirely unable to find the same. We got off our car, and walked for a brief while in the forest in the quest to locate the same but apart from the fact that we were on Kailash Gufa road; we couldn't figure out much else. One of those times, where either there should be more tourists or we needed a guide. Still that notwithstanding, we were happy with our forest excursion. The other place that we desired to visit was much deeper in the forest (around 25 kms away) - a lake named Bhainsa Darha where there are supposed to be crocodiles. There are no images of the same on the web that we could find. We desired to go there but the locals of a nearby village clearly told us that the roads are not in great condition and our Indigo wouldn't be able to go. We still thought of giving it a shot; until we were stopped at a CRPF checkpost and asked why we wanted to go in the jungle. The perplexed CRPF personnel told us that while we are free to go on (he hadn't heard of Bhainsa Darha); no tourists ventured in that area; and they wouldn't take any responsibility of any untoward happening. I don't believe there would have been any problem; but combined with the knowledge of poor roads, we decided to be prudent and turned back. Some thing after all must be left for another trip; and the exploration of that national park along with its caves and lake are on our list of unfinished business in Chhattisgarh. By this time it was past noon and we ventured in the direction of the other famous waterfalls of the area - Tirathgarh. On exiting the forest roads, we made our way back on a much more comfortable and well developed road and rapidly reached Tirathgarh around lunch time. This place is better organized with a small fee of Rs 25 to enter the fall area. The same also is the entry to the Kutumsar caves but as expected it was closed upto first of November. Located on the border of Kanger Valley, the route inside is also scenic before reaching the falls. With plenty of cars and hawkers and small shops in the area, we went towards the falls with an air of expectancy. The first sight of Tirathgarh falls is as impressive as Chitrakoot. Whilst the volume of water is more normal (Chitrakoot being ridiculously high on volume); the height is much more imposing around 40 meters. With a large number of people already camping, bathing or taking photographs in and around the falls, we found a secluded niche from where we enjoyed this tiered waterfall. It is hard to get a measure of the true height in a picture! However, one can get a sense with relativity. At the top of this waterfall near the rock on the left, is a small shape which is actually a standing man. Eventually after resting for an hour or so (the forest journey had made us tired) we followed the water flowing further down and made way for the same. To our surprise, the same Tirathgarh waterfall has another layer to it of almost the same (or lesser) height where again the water fell with volume and force. The interesting part was this had one flow of water falling as a plunge (direct free fall); and the spray generated by the same was amazing. Not only that, due to the geography of the place, with the water plunging from an overhanging rock; it was possible to walk behind the waterfall something which is not-often seen. Walking behind the falls was truly a fabulous experience on the slippery rocks and more spray being generated than what torrential rainfall could accomplish; nothing else could have refreshed us enormously. 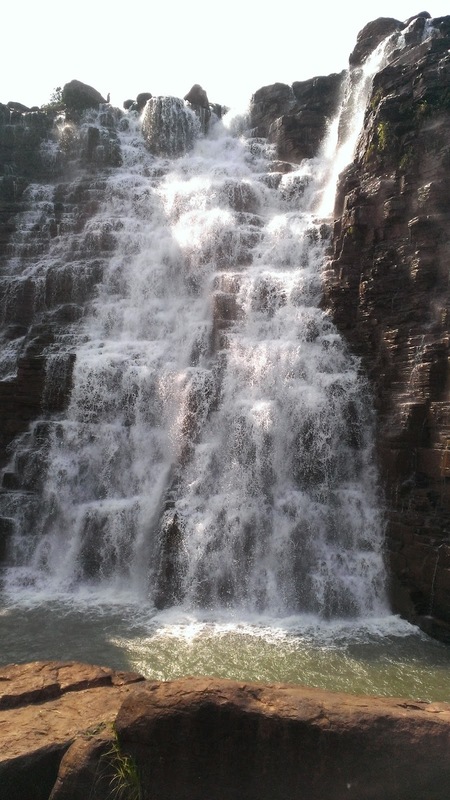 The second part of Tirathgarh waterfalls. On the left, a plunge falls behind which it is possible to go. It was evening by the time we bade a regretful goodbye to Tirathgarh waterfalls. Mandwa falls is a small fall off the village of Mandwa - a small diversion on the Jagdalpur-Tirathgarh road but it was nothing much to speak off; and frankly can be skipped. However it is the knowledge that for every Mandwa waterfall; one might find gems like Tamra-Ghoomar or Ozarde waterfalls which makes us persevere. We reached back post darkness and after dinner again ventured out in the market. There was Dusshera celebrations ongoing again; but this time the much famed chariot passed our hotel itself from where we had a good view of hundreds of people pushing and pulling the chariot causing much excitement. Again for meaning, one must refer to wikipedia and other sources. The last day of our trip was basically the road back to Raipur to catch our flights back in the evening. We left by 9am with a couple of planned pitstops. 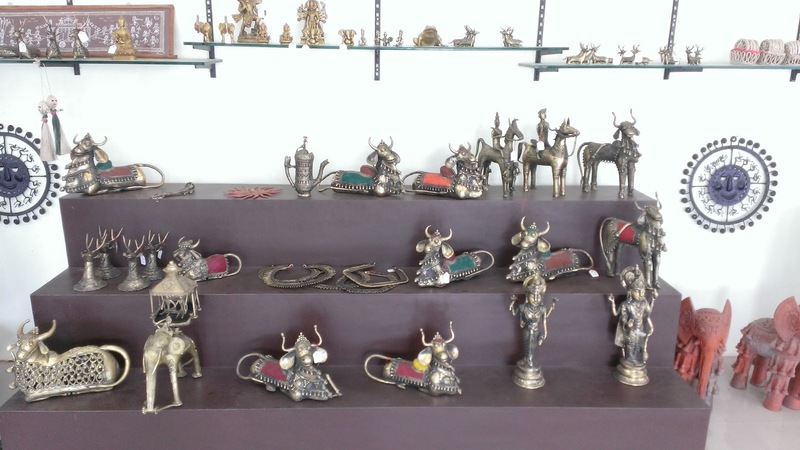 The first was Kondagaon with its handicrafts made by tribals. There is a NGO Saathi near Kondagaon, which sells multiple artifacts and handicrafts made by locals which we visited and appropriately bought a bunch of items. The most interesting of them being a bamboo made pipe which generated music on swinging the same. 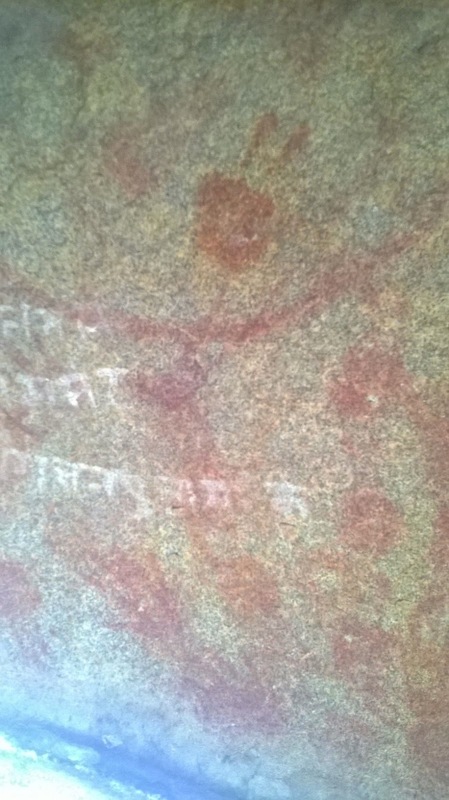 We continued on the road to Kanker before taking a diversion for Udkura which are known to have prehistoric man's rock paintings. On hitting the village, and asking for directions we were readily directed towards the rocks which were known to have been painted thousands of years ago. Reaching an isolated place with a temple and some boulders, we started searching for paintings by man; finding some pictures similar to the sample below. Supposedly ancient rock paintings from thousands of years ago. Palm prints and a stick figure in this one. There is also the more famous UFO paintings in Charama; which we chose not to go. Continuing on our route, we just about made it to Raipur airport with reasonable amount of time to spare for our flights. Thus capped a marvelous and safe trip to the Bastar district of Chhattisgarh. - The road conditions everywhere were excellent. - The normal tourist oriented places felt extremely safe with plenty of people. - Stay at Jagdalpur- our stay was at Hotel Laxmi Palace which was average at best. Some of the other hotels which looked better (but we couldn't find accommodation) were Hotel Suri International and Hotel Devansh. In peak season, it might actually be better to book rooms in advance rather than searching for one on arrival. - Food options - as a normal small town; there were a few options but not many. We particularly enjoyed buffet breakfast daily at Vaishanvi Restaurant of Hotel Devansh (Rs 140). - All national parks and caves are officially closed from July to 1st November. 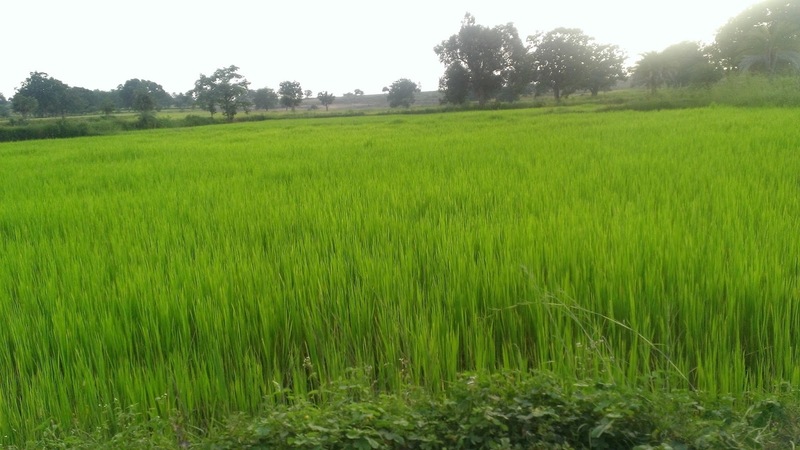 Day 2: Jagdalpur to Chitradhara waterfalls, Chitrakoot waterfalls, Tamra-Ghumar waterfalls. Local Dusshera celebrations at night. 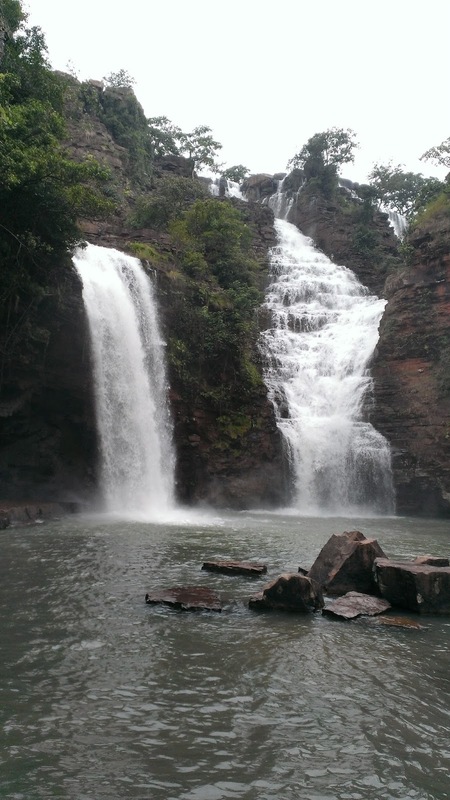 Day 3: Jagdalpur to Kanger Ghati national park, Tirathgarh waterfalls, Mandwa waterfalls. Local Dusshera celebrations at night. First things first, how safe is Chhattisgarh? This was a question uppermost in our minds as we ventured on this trip. Raipur and Jagdalpur are as safe as most other typical Indian cities. The villages even more so! You can see the hustle bustle of a normal small-town city in Jagdalpur (which is the heart and capital of Bastar district). There will be oddities as one can see lots of tribal people roaming freely as we saw especially during the Dusshera festive season for which this place is famous. The popular tourist spots of Chitrakoot and Tirathgarh are full of hundreds of people and felt extremely safe. Even the non-popular spots which we went to, like the other waterfalls which were mostly at the back of some village; felt quite normal as we roamed around freely even in local village markets and communicated with villagers all of whom were friendly though stared at us with curiosity on occasions. Barring one discussion with CRPF personnel (on day 3 - will talk about in another post); nowhere were we warned or felt worried at all at least at any of the inhabited places. Of course, all this must be taken with a pinch of salt; because a place is as safe until you experience the first incident yourself. However, by and large, there is no reason for tourism to not thrive in Chhattisgarh. A special mention needs to be given for road conditions in this state. They are absolutely in stunning condition. Not only the highway from Raipur to Jagdalpur (NH 43 as per maps, and NH 30 as per local signboards) is in impeccable condition; even the many times where we deviated off the normal tracks and went inside village roads we encountered only excellent roads. This fact alone made our journey more comfortable and worthwhile. The only place where roads were not good was in the forest area in the heart of Kanger Ghati which was to be expected as that is not a often-travelled road. We arrived at Raipur airport - a newly constructed beautiful airport by 9am and set forth on our way to Jagdalpur. Having booked a vehicle for four days and the driver was waiting at the airport, this allowed us to bypass Raipur and we hit the highway right from the airport. The airport surroundings were particularly green and it seemed someone had put in a lot of effort in making the airport look aesthetically appealing. Soon, as we made rapid progress on the highway,we reached Dhamtari town and took a diversion towards Gangrel to visit the vast reservoir off Mahanadi river. After crossing the vast water expanse, we continued in that direction to just touch Sitanadi Wildlife Sanctuary. We crossed some parts of the forest area where the trees encompassed the road with their shade whilst the dense shrubbery could be seen along the road. No wildlife was spotted nor expected; being so close to human settlements. Thereafter we reached Kanker bypass, and continued on towards Jagdalpur stopping for lunch along the way at a small dhaba. Getting water to drink in a bathing mug was a unique feature of the same. We reached the forested hills of Keshkal where we began to ascend over a steep dusty hill. With groaning trucks crossing us, we made to the other end and continued on towards Kondagaon and Jagdalpur. Eventually we reached Jagdalpur by evening and were slightly surprised at the absolute normalcy of a small city that greeted us. After hunting for hotels for an hour, we finally settled for one which was average at best, but had air conditioned rooms. After breakfast, we set forth on day 2 in the quest for multiple waterfalls. Whilst most people visit the more popular Chitrakoot and Tirathgarh (and rightly so! ); the other lesser known ones were devoid of any visitors altogether apart from us. This link along with the wikipedia link for Jagdalpur talks about the multiple waterfalls in the area. The first waterfall that we visited (on the way to Chitrakoot and around 20kms from Jagdalpur); was near a village and we had to ask for directions for the same. On finally reaching the same, we saw a pleasant sheet of water falling in steps (step-waterfall). The only visitors apart from us were some locals along with their cattle who had come by to drink water and a gigantic spider that we spotted near the same. Chitradhara Waterfalls. A small multi-step waterfall! A large spider which had cast a web and made its home at Chitradhara! Next to it is another smaller spider in the same web. How does a large waterfall get formed? Typically there is a river with a river bed underneath; and then suddenly there is no river bed; and the river falls off generating a waterfall! Chitrakoot was one such example. We moved on to the major attraction of the day – Chitrakoot. Stunning, gigantic, amazing, spell-bound and all the other adjectives I can come up with still fall short of describing the best waterfall I’ve seen in India so far. The largest by a distance, this gigantic cavern spits water in stunning volumes. This must be near full capacity as we saw it with tremendous amounts of water falling from five different portions of the gorge. The 20-30 meter high waterfall but with a width of maybe half a kilometre, also generated a consistent rainbow and copious amounts of water droplets. Stunning, copious amounts of water falling from five different parts of the immensely wide gorge. A rainbow can be seeing glistening at the base of the falls. A closer view. The base where the water falls is not even visible due to the steam that gets generated! This place has to be seen to be believed. It is very easy to organize tourism better at this place and monetize the same for the benefit of Chhattisgarh government. We spent a lot of time at this waterfalls; eventually we also went down (through a series of steps) to get a front view of the falls and enjoyed a boat ride which took as close as possible but still some distance away from the impact point. Front (zoomed out) view of the falls from a distance. A boat trying its best to get near the falls; this was still some distance away from the same! After visiting Chitrakoot, all other waterfalls would appear extremely trivial; but still we persevered as we made our way towards Tamra Ghoomar. Again isolated with literally no one other than ourselves, we made way through till we caught a first glimpse of the same. And we were in for a surprise! This is a fabulous almost hidden waterfall falling again at a height of more than 30 meters; with dense forests all around. The lengthy gorge runs into a dense forest and there may be a way to go to the base as well. However what we got was a view of the same from a reasonable distance as we wondered why the same was absolutely devoid of tourists. Almost hidden, the same can only be seen from one corner of the ledge where we were ensconsed. Below (not in pic), a deep gorge covered with dense jungle. Thus ended a day full of waterfall visits as we made our way back to Jagdalpur by evening. The day being Dusshera, we ventured out to Palace Road in Jagdalpur at night to watch the famous Bastar Dusshera celebrations. The entire city and its people were out on that night of festivities. With local melas, local celebrations and the like; the city had a vibrancy to it. The Dusshera celebrations itself was something we found a bit hard to understand as most people waited for a rath (chariot) and we duly did the same. The rath finally arrived amidst dense crowds, pushing and shoving along with a plethora of fire-crackers. Wikipedia explains Bastar Dusshera in greater detail, subsequently we understood a bit more of the same. Note: Google maps doesn't seem to show the other waterfalls on searching; however we relied on wikimapia and google maps during our entire trip to visit all the noteworthy places.